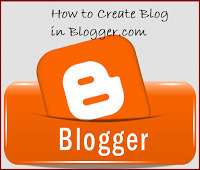 How to Create a Blog in Blogger.com Dear friends this post is only for those people (Newbie) who don't know how to create a blog in blogger.com. Blogger.com is an awesome product of Google.com, here you can share your write,opinion,picture,video free beside you also make money by many way such as Google adsense,media.net.etc..
Blogger.com is an awesome product of Google.com, here you can share your write,opinion,picture,video free beside you also make money by many way such as Google adsense,media.net.etc..
02. Sign in here with your Google account (Gmail). 03. Choose your blogger profile. 04. Click on New Blog. 05. Now Give your Blog Tiltle & blog Domain name. Enjoy Happy Blogging in Blogger.com.